Of all the zoos in the New York area, Queens Zoo is the newest. This small zoo was originally established in 1968, but later re-opened its doors in 1992. During this time, the zoo underwent a million dollar renovation, which was necessary because the zoo was previously unable to keep up with the many advances in technology and maintenance. Today, the Queens Zoo is managed by the Wildlife Conservation Society and maintained by the New York Parks and Recreation Department. One of the most unique features at the Queens Zoo is the Domestic Animal area. The area is maintained in such a way that it gives visitors a feeling of being at home on the farm - something that is quite unusual in the New York City area! In this section of the zoo, children are able to come eye to eye with domestic critters such as sheep, hogs, and cows. The newest residents to the Barn are a pair of Nubian goats. Their enthusiasm and endless energy is contagious and will be sure to be a hit with younger children. Upon entering the Marsh area of the Queens Zoo, visitors are greeted by two trumpeter swans. The birds are unable to fly, but they glide gracefully through the open waters. Trumpeter swans are named and known for the trumpet like sound they make when calling out. At the Queens Zoo, however, visitors are unlikely to witness their voice. This is because trumpeter swans use the loud sound when in distress or danger. The trumpeter swans don't feel distressed at the Queens Zoo. In fact, they are right at home in the marsh, spending time with the ducks, geese, and turtles that also share their home. 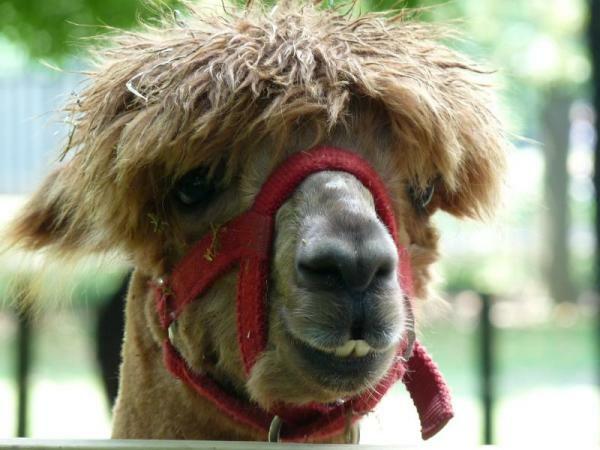 How about a "run in" with a Llama at the Queens Zoo? Well, it is definitely possible. Llama keepers at the zoo have worked hard to make the llamas accessible and safe to the public. Keepers realized that the llamas were curious about the other animals at the park and enjoyed walking around. Of course, visitors also loved the sight of llamas outside of their cages. Nowadays, the llamas can be found out and about, walking around the zoo a few times a day. This makes the experience to the Queens Zoo extra special. Visitors are able to examine the llamas up close while asking questions directly to the keeper during these special times. The Queens Zoo specializes in American animals and their history. Sections of the zoo are divided in order to showcase animals from their native regions. Visitors are invited to peek in on the California sea lions, for example, as they bask in the warm waters created to look similar to the Pacific Ocean. It is also possible to spot a few bison roaming the Great Plains. A pair of American Bald Eagles that were rescued in the streets of New York also makes their home at the zoo. These Eagles are not, however, able to fly due to injuries. The zoo truly offers a slice of Americana for visitors to enjoy.